Stock Reversals | All time highs, what is next for the markets? 18 Jul All time highs, what is next for the markets? Major Wave 3 continued onward this past week, finally moving towards our long standing 2476 SP 500 target we laid out in late March as possible. 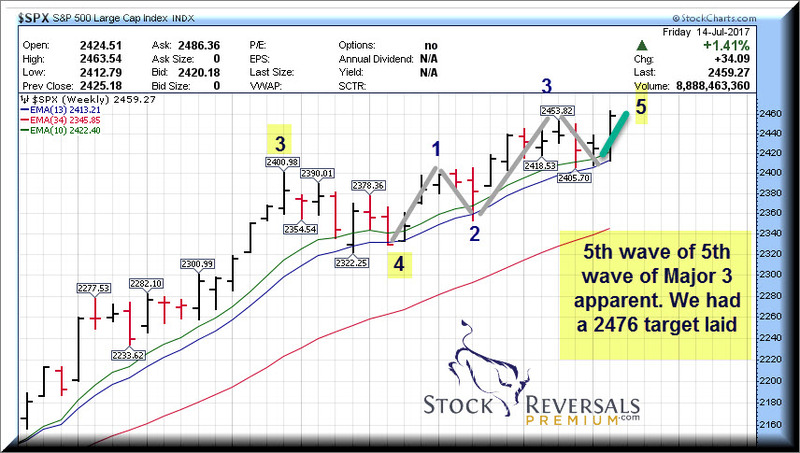 The initial target was 2443 which we discussed in early March for Major Wave 3 as a “low end” target. 2476 we felt was more “perfect” and we have an outside shot at the 2525 area as well. 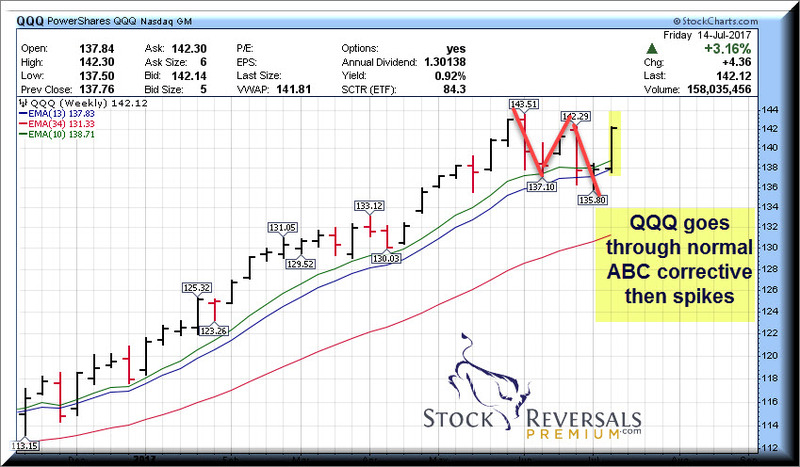 This past week leading the way were the Tech Stocks coming back into favor after an ABC Correction. 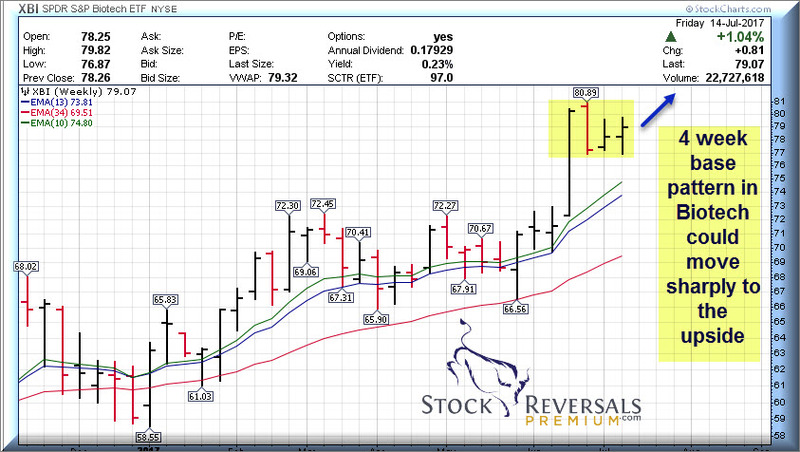 Biotech is in a 4 week base pattern which is working off a near parabolic move leading into the consolidation. Swing Trading- Always have a game plan as you enter a trade. What will you do if the stock goes up, and what will you do if it goes down? This past week in the Sunday Weekly report we came out with a list of 9 trading ideas and 4 of those really had great weeks. AAOI up 22% leading the way, CRTL up 16%, and YY up 12% naming a few. At our SRP Swing Trade service we had been accumulating YY shares as they dipped towards 55-57 ranges, and this paid off on a big breakout late in the week. We took 1/2 off the table on Monday for 17% gains. A 17% gain on a $5,000 position would have paid for over 12 months of SRP membership, consider joining! The takeaway from this is that you have to differentiate between a pullback in a base pattern that you use to buy more shares, or a stop loss in a breakdown. In this case we had advised our members to look for a drop towards 55 after our alert near 57. Indeed, that dip came as we hit 55.50 intra-day within 1-2 days of the alert, but this past week we closed near $64 for a very strong move in our favor. Less experienced traders would have taken the loss but in this case we were prepared and in fact expecting a drop, so we moved to add more shares to lower our average. This is a key tenet of our work at SRP for our members, identifying patterns before the complete and having a road map to benefit. Always go into a trade with a plan if the stock goes up or down. Here was our original chart sent with the alert in late June. 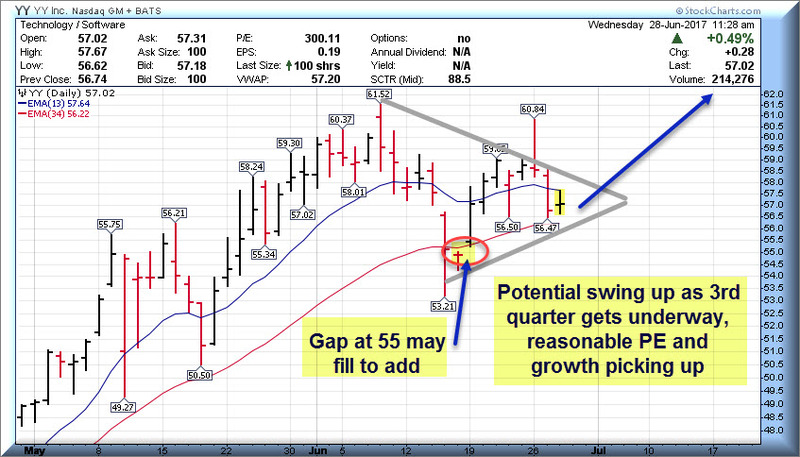 Updated YY chart, we remained long going into Monday with a large gain of over 15% and then took some off the table in the mid 65’s for 15-17% on Monday afternoon. The chart below shows the Friday close of last week. Lots of 7-10 week base patterns had been forming on top quality companies coming into this past week. 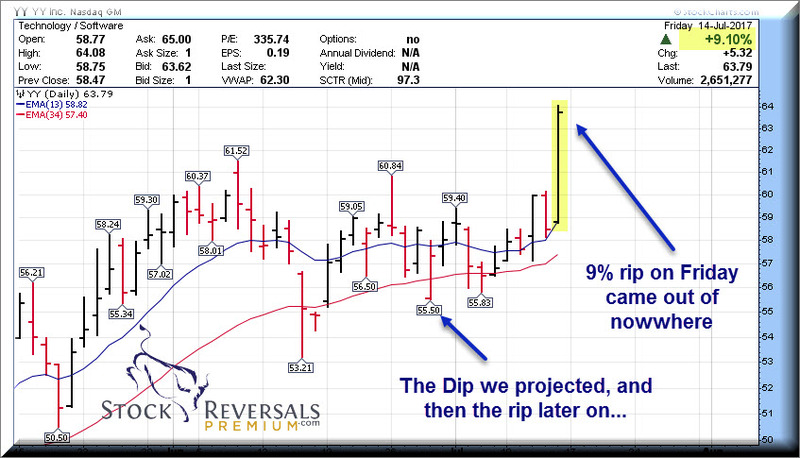 Weekly Swing Trade ideas- Each week we try to outline 10-18 ideas to consider and we often cull this list down at SRP as we try to identify our best swing trade ideas for SRP members. MOMO- 13 week base pattern following what we called a “Wave 4 correction” from 46 to 35. The past few weeks we closed out LABU for 19% gains, 1/2 YY for 15-17% Gains, TWLO for 17% gains, and took profits on BIVV for 14% Gains just naming a few!